Ricco Larsen began his NNIT career in 1999 and has since been responsible for several areas in NNIT. Most notably in recent years, from 2011-2014, Ricco Larsen was General Manager for NNIT's operations in China, responsible for establishing NNIT's offshore development and support center, while also establishing local sales, consulting and delivery capabilities. From 2014, Ricco Larsen was made responsible for building NNIT's global operation service function, and was promoted Corporate Vice President in May 2015 assuming global responsibility for IT operations and support on all global outsourcing clients across NNIT's global delivery units and entities. "Since entering NNIT in 1999 I have witnessed how the NNIT culture and DNA is deeply embedded in our work. Our teams and clients tend to notice the cultural offspring in the way we engage. 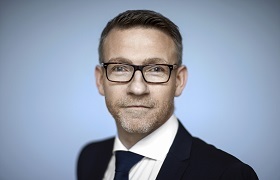 I value dearly our past in the Novo Nordisk group as well as our experience and growth in the International and Danish IT service market, which has made us the successful IT service provider and integrator we are today. Our track record also implies great respect for the responsibility we have taken upon us and the trust we enjoy from our clients – and it pushes us to be the best we can be every day. After all, that is who we are".